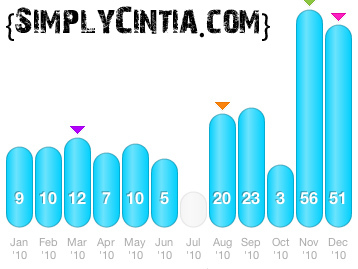 This is my year in monthly workouts. Most of you know I had my Z Girl in July, which meant 0 workouts. 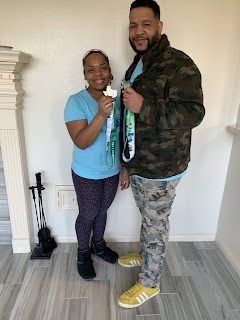 As the year ended I found more strength/recovered from giving birth. You'd be surprised how hard it is to retrain some muscles groups that were cut so I could have my beauty. Anyway, I want December to be my best month yet. My goal is to surpass my 61 mile month record. 11 more miles and I'm there. If you want something to taste like sugar, use Splenda. Splenda works great with oatmeal. It works well with teas and coffees. Truvia is great but not as sweet. It still gives me the sweetness I need and it leaves no after taste. I decided to buy the Splenda flavor for coffee and I'm not a fan of it (though I keep drinking it). I like some flavored coffee but I drink it for the boldness of it first, flavor is last on my list. I don't even have to have sugar as long as I have milk. 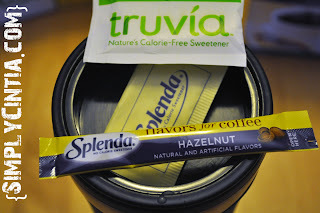 Splenda flavors for coffee was an attempt to save points in days where I really wanted coffee without using milk. I usually drink my coffee with skim milk because it's low in points and it helps me get calcium in. I bought some fat free half and half but I won't do that again just cause I can get more milk for my points. A bit of a random post but now you know my current coffee and exercise habits. 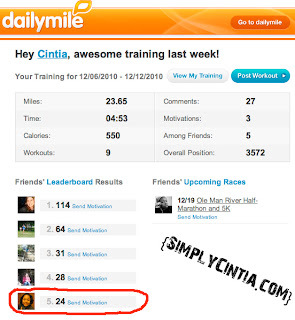 I've been using dailymile off and on since nov. of 09, but i've been a regular in using it since Sept of this year. You are right, friends do encourage you alot. It's a really good site. Good Job! I like your numbers. I might have to try those Splenda coffee flavorings and see if I like them. The points values for my coffee creamers is staring to get to me!